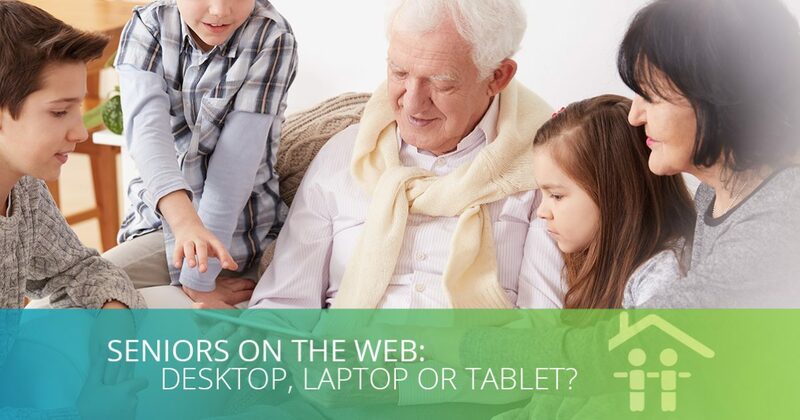 Seniors On The Web: Desktop, Laptop or Tablet? Seniors belong on the internet as much as any of us, and they are going online in growing numbers. The secret to getting your loved one to embrace everything the internet has to offer is choosing the right technology. 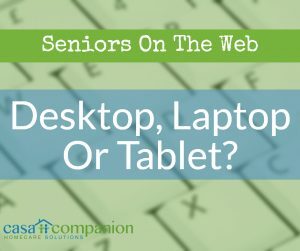 This month, we help caregivers, home care aides and loved ones decide which Internet cruising device is the right one: a desktop, a laptop or a tablet? The best way to choose the right device for connecting to the internet and everything available there is to understand what you want to do with this device, and where you want to do it. We’ll review the three types of devices, give you the specs, and help you decide which device is right for you. The ‘original recipe’ personal computer, a desktop is comprised of a monitor and a CPU, sometimes called a hard drive or tower. Accessories: You need a keyboard and mouse to use it, and can connect a printer, speakers, a camera or a second monitor. Internet Connection: You can connect to your internet with a wire, since you’re not going anywhere. Risks: there are no restrictions on what you can and can’t do on this machine, so you could wipe the hard drive and make it unusable, or just delete things you didn’t mean to delete. Capabilities: this is a powerful machine, and assuming you have sufficient processing power, memory and bandwidth, you can run any software, connect to any streaming service and video chat all day long. You will see the full ‘desktop’ versions of all websites. Anything a personal computer can do, a desktop can do it – it has the most range and flexibility. Laptops are sized based on the screen, measured on the diagonal just like televisions. Laptops range from 13” to 17” – any larger, and they’re too heavy and awkward to move around. Any smaller, and they’re just glorified tablets because there’s no room inside for all the components you need. Accessories: Laptops are desktops with the monitor, keyboard and ‘mouse’ attached, but you can connect a separate monitor, keyboard, mouse, printer, camera and speakers to a laptop to improve your workspace and ergonomics. Range: Take it anywhere! The only limitation is battery power, since laptops are portable and don’t need to be plugged in to work. But, you will need to connect to a Wi-Fi network to access the Internet wherever you go. Internet Connection: you can connect wirelessly to your Wi-Fi network, or by Ethernet cable to your router. Risks: as with a desktop, there are no restrictions on what you can and can’t do on this machine, so you could wipe the hard drive and make it unusable, or just delete things you didn’t mean to delete. Capabilities: same as a desktop with possible memory and processing limitations. On the spectrum of smartphones to laptops, tablets are mega-smartphones. They are mostly screen, with virtual keyboards you type on and touch screens that don’t need a mouse. Tablets come in all sizes and from all directions: iPads, Galaxies, Kindles, Nooks, Surfaces, ZenPads, and more. Accessories: An external Bluetooth keyboard and a stylus that is like a pen – but is NOT a regular pen! – can help work around the touch screen’s size. Range: Take it anywhere! The only limitation is battery power, since tablets are portable and don’t need to be plugged in to work. And, they have fewer innards soaking up battery life so their charge lasts longer than laptops’ batteries do. Internet Connection: They can connect wireless to a Wi-Fi network, or use cellular data just like a phone. Risks: for peace of mind, there are restrictions on what you can and can’t do on a tablet. It’s very unlikely you could access the hard drive or OS and make it unusable. Phew! Capabilities: tablets are not as powerful as personal computers, and they don’t have as much memory, processing power or bandwidth. Their virtue is ease-of-use, portability and long power life. You will see the modified ‘mobile’ versions of all websites that are mobile-optimized. 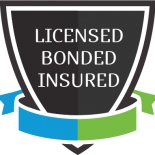 You can access software that has a mobile app, connect to streaming services, video chat and use social media. Nearly anything you can do on a phone, you can do on a tablet. When helping the senior in your life choose a device that will increase their access to the internet, consider the pros and cons of desktops, laptops and tablets. The right device can help loved ones enjoy what the web has to offer!